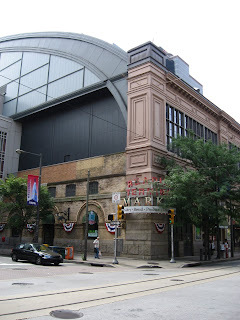 A while back, GeekBoy and I had an idea to spend a weekend in Philly - being tourists in our own city. Neither one of us had really been to the sights in, um, nearly 20 years for me, and longer than that for him and we thought that it might be nice to get reacquainted with all that stuff that's only 30 minutes away from us, yet seems like another world sometimes. 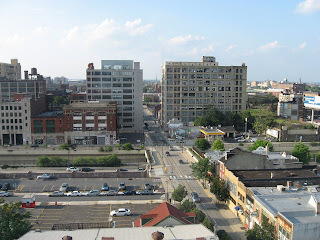 (and it sometimes is - if you've any experience on 76 - the Schuylkill Expressway, or alternatively named the 'sure-kill expressway') We kept chatting about it and then I got an email that Sheraton had opened a new Four Points hotel by the Convention Center and was running a special room rate - it was good over the holiday weekend (yay! 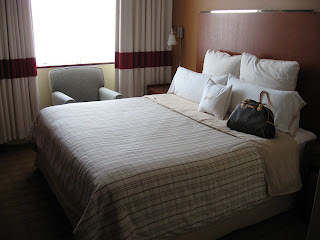 ), so I booked us a room. What better way to celebrate our nation's Independence Day than in the spot where the whole reason for celebrating took place? We headed downtown on Thursday night after work. I was pleasantly surprised by our hotel. 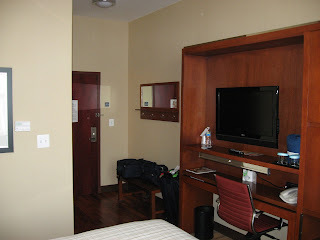 Recently renovated, it was clean, well appointed and had a bar off the lobby (bonus points). It was small, but the furniture was all space efficient. And really, we weren't planning on spending that much time in the room anyway. It was more of a 'home base' than anything else. I liked that they had photos of Philly stuff on the walls. And the window was like 15 feet high- you can't tell from the photo, but I could (and did) stand up on the window sill and press my head against the glass like in Ferris Bueller at the Sears Tower. The bathroom was small but nice as well. 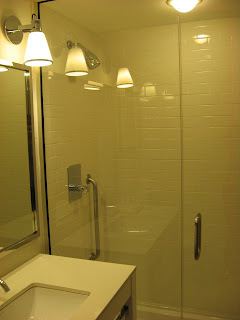 I took pictures of it because I liked the subway tiles they used on the walls and the glass shower. 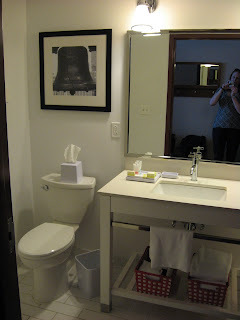 We're (eventually) going to gut the 2 very 70's-esque bathrooms we have at Casa de Hosta and I'm always looking for ideas. 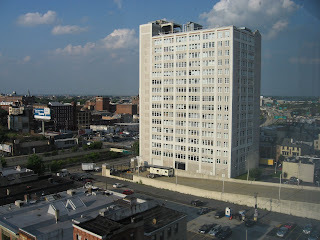 Basically, we were right next to the Convention Center, and our room overlooked Vine St. and 676 (aka - the Vine St. Expressway) as well as New Jersey. To be honest, I wasn't thrilled with the view. 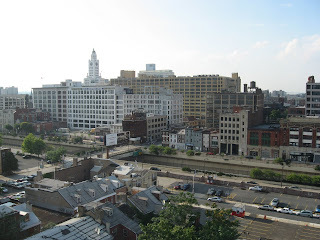 I would have rather been on the other side of the hotel, where we would have been looking at City Hall and Center City, but later on in the weekend I would be tickled we were in the room and on the floor that we got. Once we got done with stashing our stuff, GeekBoy and I headed out for some grub. 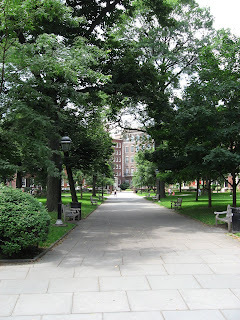 We walked down to Fez on 2nd Street, just off of South St. (where all the hippies, er, I mean yuppie sellouts trying to be way too hip and chic meet) We passed through Washington Square on our way there and I made a mental (and verbal) note to go back the next day to check it out. My feet were not happy. For some reason I have a disorder that causes me to wear the complete wrong shoes whenever we go someplace that requires a lot of walking. I do have shoes that are meant for walking around in, I just don't seem to ever bring them with me. Anyway, back to Fez. It was really dark inside, but after 10 minutes or so, our eyes adjusted and then we could smirk and snicker at the people who came in and tripped and stumbled and stood there like a deer in headlights trying to figure out where the voice was coming from that was asking them to follow it. On the weekends, they have belly dancers. Unfortunately for GeekBoy - it was Thursday night. They also have hookahs; you can select from a list of fruit flavored and aromatic tobaccos and sit around looking like you're lazing about in some opium den from the 70's if you'd like. I wanted to try it, but GeekBoy didn't want to, so no hookah for me, boo hiss. What was funny was that this group of girls came in, ordered their hookah and then 2 of them immediately stepped out for a cigarette. What? You just ordered 5 pounds of tobacco and a water pipe to your table, and it's not enough? Really? Strangely though, the place was not smoky at all. They must have an unbelievable ventilation system. The food. Was. Really. Good. I'm not an adventurous eater (right Mom?) and I loved everything we got. GeekBoy and I went all out and ordered the Fez Feast (for $25/person!? ), which is a 7 course meal. There was a bit of fear in the beginning, for me, because it was so dark in there, and I have this thing where I won't eat something if I can't recognize it, so I made GeekBoy try everything first and tell me what it was before I had some. But, I had some of everything and I was shocked that I liked it all. So there's a recommendation for you; if you find yourself in Philly and want to try some Moroccan food, a hookah and possibly some belly-dancing, definitely check out Fez. We took a cab back to the hotel. My feet were grateful. Then I chucked the shoes under the luggage rack, not to be seen again until they were gettting packed to go home. Friday. On Friday we didn't have plans until the evening, so we wandered around the city a bit. First, we strolled over to City Hall. In all the years I've lived in the Philly area (roughly 29 years), I have never walked up to City Hall or set foot in the courtyard there. 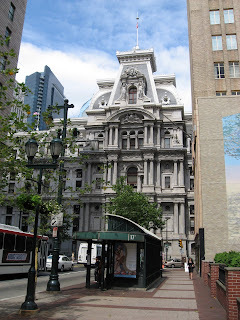 I never even knew there WAS a courtyard in City Hall until I saw the movie 'Philadelphia'. How's that for taking my home city and its' sights completely for granted? 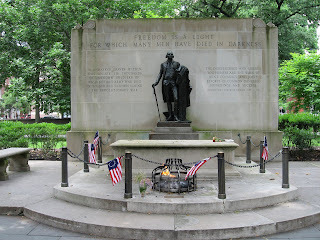 Washington Square, where the Tomb of the Unknown Soldier from the Revolutionary War and the Eternal Flame are located. 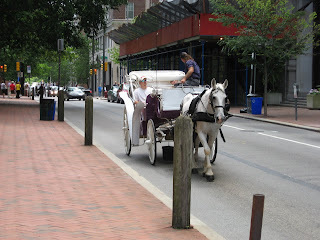 A horse and buggy! I think I would like to go on one of these, even though they are a complete tourist racket. However, I'm not sure that the horses get treated all that well, and I'll be damned if I'm going to pay and support less-than-ideal conditions and treatment of working animals. 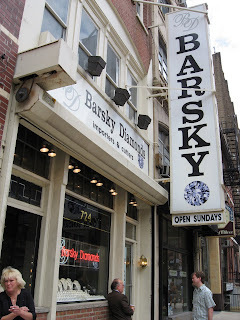 We took a walk down Jeweler's Row as well and stopped in at Barsky, where my mom bought the ring I got for my high school graduation. 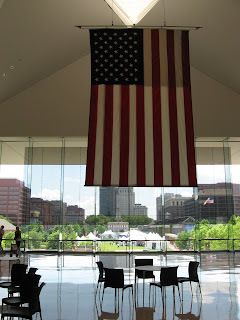 GeekBoy and I visited the National Constitution Center and really enjoyed the feature 'Freedom Rising' that was running that day. After seeing it, we both were all worked up and wanted to go overthrow the government of a poorly run country somewhere. Or burn something down. Or storm through the streets with pitchforks and torches. It was inspiring, to say the least. 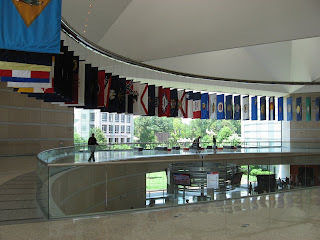 The Consititution Center is a wonderful tribute to the governing document of the USA. 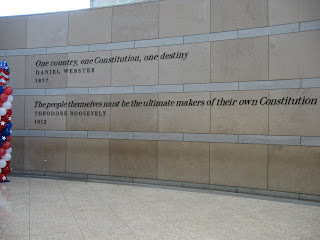 There is a space in the NCC called 'Signers Hall', where life-size bronze states of all of the signers of the Constitution are located. They look like they have just taken a break from debating the Articles of Confederation and are all standing around in little groups, discussing the day's events. 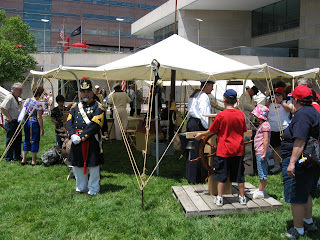 None of my photos of it came out, so I gleaped this picture directly from the NCC website. It's eerie and cool to walk around them. George Washington is much taller than you'd expect. Over the holiday weekend, in addition to Independence Day, the city was celebrating Abraham Lincoln's 200th birthday and July 4th from the Civil War to the present. 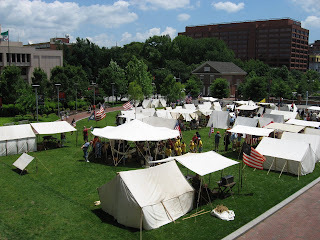 There were tents set up all over Independence Mall, with Civil War reinactors (is that a word?) and all sorts of information about Lincoln. 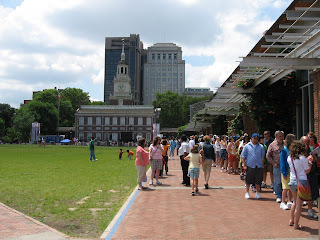 Looking at Independence Hall from the Liberty Bell Pavilion. That's the line to get in to see the Bell. We went the next day when the line was considerably shorter because everyone had crowded onto the Parkway for the concert and fireworks. And back towards the NCC. 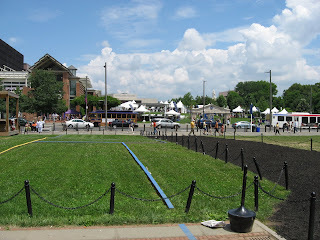 The outlines you see on the grass are where they are excavating around the area. 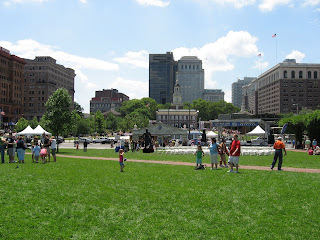 Some pretty neat stuff has been found in and around the Independence Mall area. So much history and so little time to get to it all! I'm going to stop here, for now. This is getting long, and I still have lots to tell you about. So, I will leave you now, in the early afternoon of July 3rd. 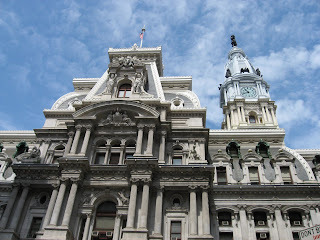 If you have any plans to visit our fair city in the future, check out http://www.gophila.com/ , there is a wealth of information on places to stay and things to do while you're here. It looks like you had a fun weekend. I can't believe you saw so much in such a short amount of time. My feet would have been killing me too.